It occurred to me as we woke at first light and began breaking down camp that it was Friday the 13th and we were starting our day at a place called Devil’s Fork. But it promised to be a beautiful day, the late spring skies already a brilliant blue and we were anxious to get started. Omens be damned. We met Brooks Wade at the Devil’s Fork boat ramp promptly at 8am, packs loaded and alarmingly heavy during the half mile walk from our campsites. Brooks welcomed us aboard his pontoon boat and introduced us to an older gentleman who would share our ride that day. 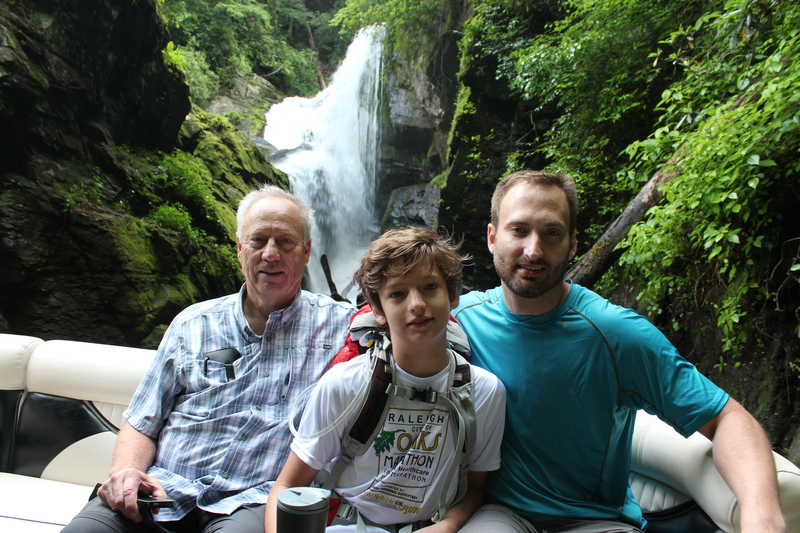 Brooks would drop us off first at Laurel Falls, then deposit the other gentleman seven miles further back on the trail at Cane Break where he would tackle the toughest portion of the entire Foothills trail as part of his 13 mile day hike. He was very fit, maybe 70 years old with a thick shock of white hair and neatly attired in brown hiking clothes. There was a distinct military bearing about him and he looked like he could still ace an Army PT test without breaking a sweat. Around 5’8″ and wiry, he sat ramrod straight, had clear, intelligent eyes and a neatly trimmed mustache. He carried only his lunch in a small haversack while we all sat around the boat with comically overstuffed backpacks, preparing to hike just 22 miles over three days. He made a bemused comment about the size of our packs, which seemed at first a benign observation, but I’m pretty sure what he was thinking was “what a bunch of pussies”. As we made our way across Jocassee, Brooks would stop from time to time to give us little tidbits of area history or a geological factoid. The area we would be hiking, for example, was classified as a rain forest due to the sheer volume of annual rainfall it receives – some 90+ inches. It is one of only two such rain forests in all of North America – the other being in the Pacific Northwest. This was fascinating to me. The lake was almost totally undeveloped, with the exception of just 92 high-end homes clustered in one small area of shoreline. Aside from that it was endless trees, rocky shores and green hills. The trees were different here – conifers, hemlocks and poplars – which gave the lake a distinctly alpine feel. We were the only boat on the lake at that time and Brooks mentioned that most days he spends on Jocassee running his guide service, he has the lake almost completely to himself. It seemed to me a novel and exceptional way to make a living and Brooks carried a perpetual grin, as if he had discovered a great secret. In fact, he had. I was very jealous of Brooks. As we got close to our hopping off point, he maneuvered the boat into a narrow cove to catch a beautiful glimpse of lower Laurel Falls. It was a gorgeous sight – the first of many falls we would see along the trail and further evidence that we were, indeed, entering a bonafide rain forest. A cool mist from the churning bottom of the falls settled over us as Grant snapped pictures of everyone. A few short minutes later Brooks positioned the boat on the shore where we exited onto the trail. The older gentleman mentioned something about there being a Starbucks about a mile up on the right. A regular comedian. We hoisted our packs and after a few minor adjustments – a tug on a shoulder strap here, tightening of a hip strap there – we were on our way. Day one of any multi-day backpacking trip is hard. You’re legs are rubbery, your lungs seize in protest and your shoulders chafe against a suddenly burdensome load. 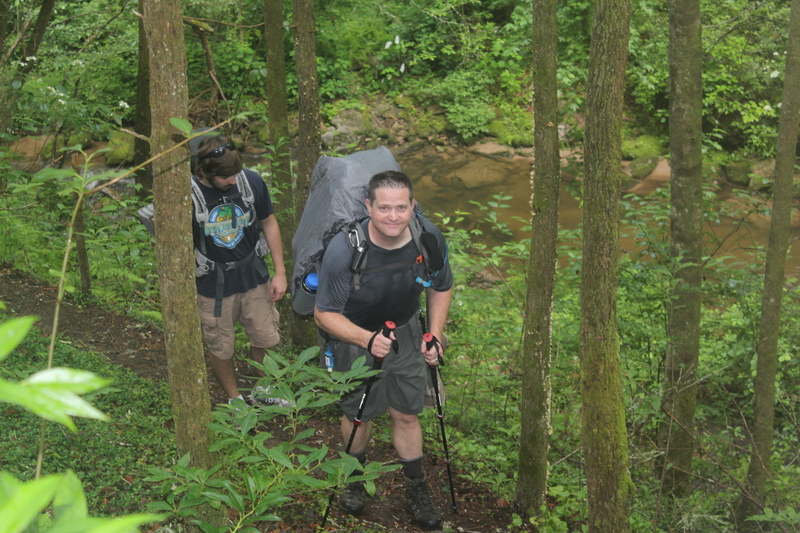 Our goal on this first day was to make it to the Laurel Fork parking lot, approximately eight miles down the trail. Along the way we would gain 1,200 feet in elevation, peaking near Flatrock Mountain, then descend around 800 feet to the parking lot, just off US Highway 178. A lot of uphill, followed by a lot of downhill, all while carrying the equivalent of a chubby 2nd grader on your back. But it’s worse than that. This is a load which does not want to be lifted – whose natural state is to sit in a bulky heap on the ground. It is a load that never escapes your notice, even for a second, and which requires constant adjustment of straps and shifting of hips and shoulders. You are always dialing in the fit, looking for that elusive comfort that you know you will never achieve. It was a long slog that first day. At one point we lost the trail at a poorly marked area intersected by a forest road. We had to double back and, by the end of the day, walked a total of ten miles though our actual forward progress was only 8.1. We finally, mercifully came to the Laurel Valley parking lot around 4:30pm that afternoon. We camped at at small site adjacent to the gravel lot. It wasn’t the remote, private site I would have preferred, but we were all exhausted and thrilled to be able to stop, regardless of any aesthetic shortcomings of the campsite. We could hear water from the site, so after setting up tents, Grant and I walked the half mile down the gravel access road to the US Highway 178 intersection, where there was an old stone bridge over Estatoe Creek. We scrambled down the bank and found the swift-flowing Estatoe an exceptional source for pumping water. We set up under the bridge, shed our boots and socks and soaked our aching feet in the cold stream while pumping water for everyone back at camp. I cannot adequately explain how good it felt to sit and soak those aching feet – it was magic. At one point, enjoying myself and pumping water absent-mindedly, I felt something on my big toe and looked down to find a crawfish taking exploratory pinches. I reached down to catch him and he vanished behind a rock. It reminded me what a strange little world we had entered. Mark joined us down at the river and eventually we all headed back to camp, fresh water in tow. Patrick, Cole and Ashten were asleep and Fran was resting as well. 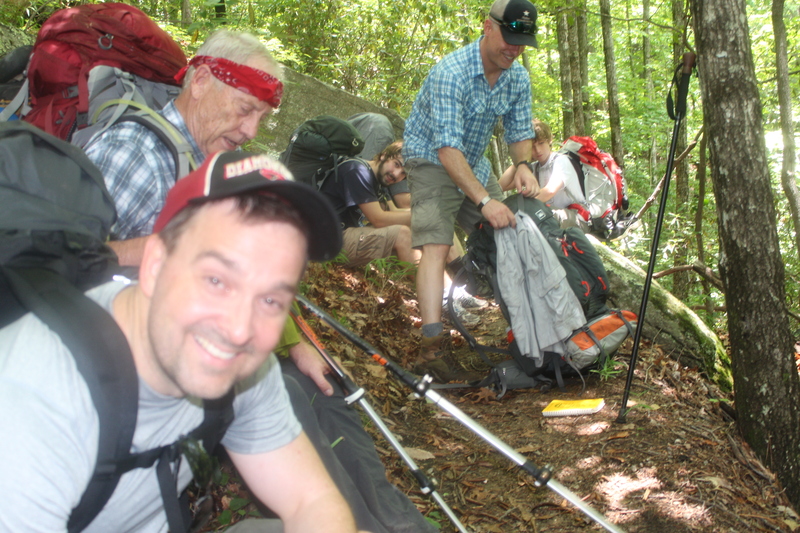 Unfortunately Fran’s back was giving him fits and his legs felt weak – possibly a nerve issue and he had decided to bow out the next morning, sure that he would find a ride back to Table Rock from someone coming off the trail. There were several cars in the lot by our camp. We were all disappointed for him but his performance that day was nothing short of heroic. Ten miles with a heavy pack – in the mountains no less – at 72 years of age. We were all exhausted and Fran had 30 years on us. It was damn impressive. Another late afternoon storm rolled through around 6pm, just as I was putting the rain fly on my tent. I climbed inside, heated water for dinner and opened the second bottle of wine purchased Thursday in Saluda (which I’d carried all day in my pack). Turns out, Cabernet Sauvignon is the perfect paring for freeze-dried beef stew – something you will likely never hear during a winery tour in Napa Valley, but true nonetheless. I was famished and ate slowly, savoring each bite, enjoying the wine and listening to the heavy rain against the tent. Around 8pm, the rain stopped and we all came out to attempt a camp fire, but it was a monumental task with the mostly sodden wood nearby. Thanks to some fire starter Fran had purchased, we got some semblance of a fire going, but it was high maintenance and smoky. We soon turned in, tired, grubby and happy to have day one in the books.